Go straight for 800 miles, then turn left at the thistle. The woman inside our Global Positioning System device has a bad attitude. If I don’t follow her instructions exactly while I’m driving, there’s a moment of frosty silence, after which she says, “Recalculating.” You can tell from her tone, though, that what she wants to do is scream at me, “you’re an idiot!” When I eventually manage to find my destination in spite of that contemptuous woman in the GPS, I can’t help gloating a little. One can only imagine, then, how proud of themselves monarch butterflies must feel: They make an annual journey of thousands of miles without any help from a GPS. What is even more remarkable is that no individual butterfly completes the whole round trip. It takes several generations to make it back to their summer home. Monarch butterflies are common throughout North America during the summer, but a monarch born in May, for example, will only live a couple of months. That’s also true of a 3rd generation monarch, born in July or August. 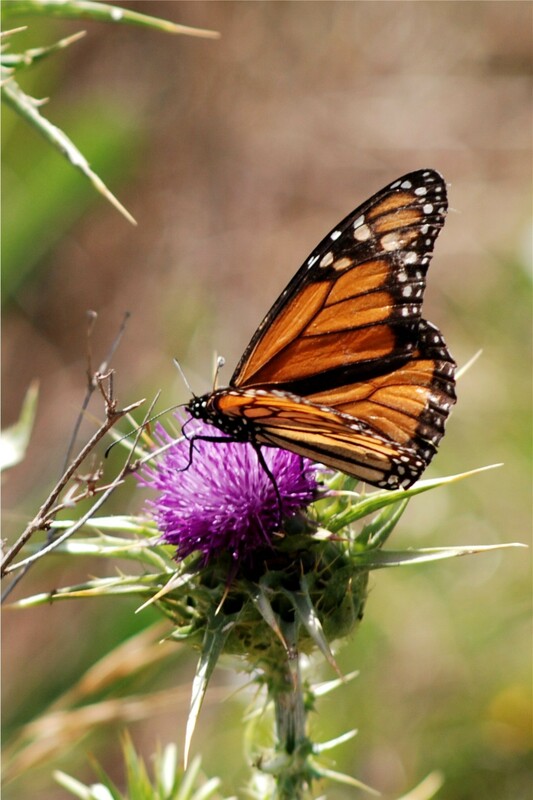 It is the 4th generation that lives a long time by butterfly standards; the monarchs born in September and October are the ones which head south when cool weather begins in the higher latitudes. The eastern monarch butterflies — if you listen closely, you’ll detect their accent — head for their winter home in Mexico, a trip of as much as 2,500 miles. The more laid-back monarchs who live west of the Rocky Mountains spend the winter near the beach in California, notably at Pacific Grove and Santa Cruz. So the 4th generation gets to the winter habitat, and after flying all that way they settle in for a nap — in the same grove of trees where their ancestors hibernated the previous year. That’s incredible, don’t you think? How do they know to go back to that exact spot, even though they’ve never been there? Scientists are still trying to figure that out. Anyway, they sleep off the long journey, and along about late February or early March, Generation Four wakes up. After a brief mating period, they collectively decide, “We’d probably better start heading north.” So they do. Along the way the females lay eggs; pretty soon their generation dies off after living to the ripe old age of six months or so. The 1st generation — born in March and April — continues the trip, but they only get part way before they pass the torch, so to speak, to Generation Two, born in May and June. Both of those groups die out somewhere along the route, but the trek continues with Generation Three, and the cycle is completed by Generation Four. Various websites track the northbound and southbound migrations; one is reporting that as of late March, “Monarchs are pouring out of Mexico right now.” (www.learner.org) It may be a while before the butterflies get to your town, since the speed at which they fly is roughly 6 kilometers per hour. That’s about as fast as you could walk to your house from Mexico, assuming you had a good tailwind. And weren’t distracted by a bad-tempered GPS lady, trying to convince you to take wrong turns. This entry was posted in Science and tagged monarch butterflies. Bookmark the permalink. I’ll never forget sunrise at a Monarch butterfly sanctuary near Morelia in Mexico: as the sun hit the sleeping insects’ wings, it woke them up. Soon the air was filled with 6 million fluttering butterflies. Truly incredible. I’d be interested to know about the sound of that experience. Obviously if it had been 6 million birds, the noise would be deafening. Do that many butterflies make a detectable noise? I actually remember a deafening silence. There were just three of us watching the forest awaken. It was very surreal, though, so maybe I wasn’t as aware of sound as I normally would be. Awesome! I suppose it’s possible that there may have been some slight ambient sound — a breeze moving the branches, perhaps. If the air was still, though, it must have been that “deafening silence” you describe. Thanks, Jen. A friend showed me the Santa Cruz crowd one year. So easily missed if you weren’t looking for them. When I see a straggler wandering through my yard I wonder if it will make it all that way.